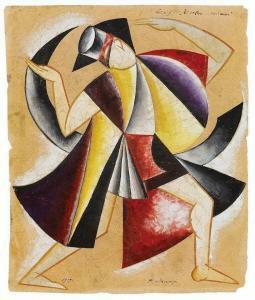 Find artworks, auction results, sale prices and pictures of Vadym Georgevich Meller at auctions worldwide. Lot 431: "Costume Design Sketch"
Titled in Indian ink upper right.This sheet also fits the series of designs for Bronislava Nijinska's ballet "Masks", which was performed in Kiev in 1919. Irregularly cut, the lower right corner torn, minor tears to the edges, abrasion and studio traces. Cf. cat. Kostümentwürfe der Russischen Avantgarde mit Werken aus der Sammlung der Familie Dr. Mark Soibelmann, Apolda, undated, p. 40. Gouache and tempera over pencil on machine-made laid paper. Vadym Georgevich Meller - "masks"
Costume design.Vadym Meller was born in St. Petersburg but worked in the Ukraine. 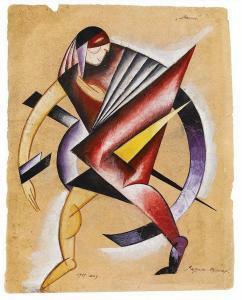 He designed several costumes for the ballets of Bronislava Nijinska (1892 - 1982), who was the younger sister of Vaslav Nijinski and was also successful as a dancer and choreographer. The edges irregularly torn out, numerous creases and small tears, abrasion, a minor loss to the upper left (1 x 2 cm), pin hole to the left edge. 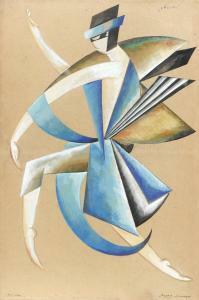 Further designs for the ballet "Masks" by Bronislava Niyinska im cat. Kostümentwürfe der Russischen Avantgarde mit Werken aus der Sammlung der Familie Dr. Mark Soibelmann, Apolda, undated, p. 40.Cf. a similar sheet auctioned by Sotheby's, London, 28th November 2006 , lot 87. Gouache over pencil on yellowed, machine-made laid paper. signed in Cyrillic l.r., dated 1919 l.l. and inscribed Maski in Cyrillic t.r. 53 by 35cm, 21 by 13 3/4 in.